This mustard yellow turtleneck has easily become one of my favorite fall items! When I added this sweater to my closet, my plan was to wear it on weekends with leggings. I didn’t realize though that mustard would become such a hugely popular color for fall, or that I would love the fit/feel of this sweater so much. This made me want to find a way to dress it up for a work day. Cue work day layering! Every year as the weather starts to cool I find myself layering a lot more when it comes to my office or court day looks, both to stay warmer but also just because I want to feel cozy even though I’m at work. When it comes to how to layer for work; layering a cozy sweater underneath a blazer has become my go-to move. Read to the end of this post for tips on how to layer for work! Wearing a blazer that is a complimentary color or pattern over a sweater looks professional, but allows you to be comfy and cozy. This mustard turtleneck would look great under a plain black blazer – it would actually be a very polished look for a cold fall/winter work day – but I wanted something with a bit more flare. I found this plaid / check blazer at H&M and instantly knew it was the perfect match for this layered work day look I had in my head. If you look closely you’ll see that the thin lines between the black and white plaid squares are mustard yellow. Unfortunately the blazer has sold out, but I did find two similar blazers. Both are black and white plaid, and one also has hints of mustard yellow. I’ve included them in the widget at the end of the post. Given that I went with a statement blazer for this look, I decided to keep the rest of the look simple. I’m wearing my go-to black pants – the Sloan pants from Banana Republic. I also went for my black suede heels. I love a good patent pump, but when opting for a cozy look, i find suede to be a better compliment. Especially in the colder weather! I was given these beautiful studded hoop earrings during New York Fashion Week, and am so glad I was. Hoops are not something I probably would have bought on my own, but by being given them I was able to try out this trend. I didn’t think hoops would be work day appropriate but these gold hoops with black studs work perfectly with this sweater and blazer combo. Enough about this outfit (… though I do love it so much I could absolutely babble on about it for ages haha). Let’s talk layering in general; and more specifically about how to layer for work! 1) Check the Bulkiness: What I mean by that is; make sure the sweater you are wanting to layer fits comfortably under a blazer. I have a ton of lightweight sweaters that I layer under blazers, but you aren’t restricted to thin sweaters only. As this outfit (hopefully) shows, you can wear a thicker knit, just make sure that it doesn’t feel bunched up or uncomfortable. You may want a blazer that is a bit big on you to accommodate a thicker sweater. 2) Sleeve Length: Both for look and comfort, pick a sweater / blazer combo where the sleeves of the sweater come down longer than the sleeves of the blazer. This will be more comfortable than having your sleeves the same length, again because of bulkiness/bunching. It also adds to the look of the outfit by giving a pop of color at your wrists. 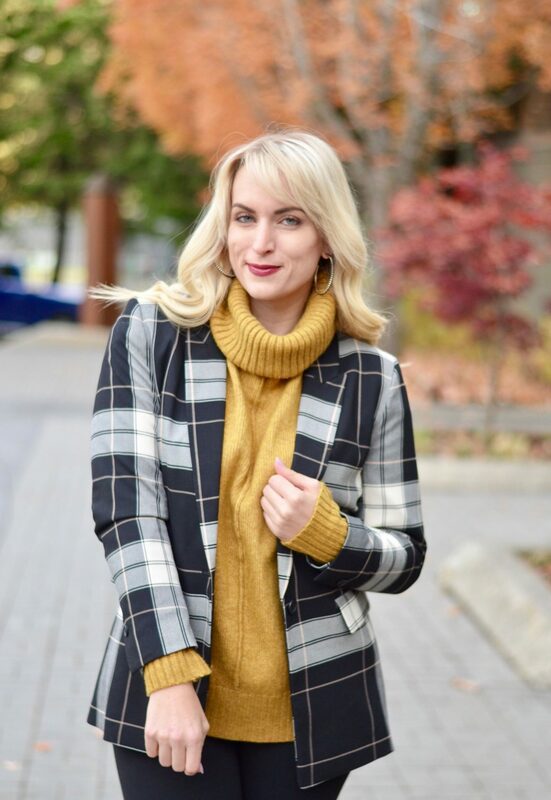 3) Complimentary Colors & Patterns: A black blazer will look great over just about any sweater and so that is an easy ‘how to layer for work’ outfit. If you want something a bit more bold though, look for a blazer in a pattern that compliments the sweater you’re wearing. With so many great glen plaid blazers out there this season, it is easy to find a blazer with burgundy stitching (perfect for wearing over a burgundy sweater), navy stitching (perfect for a navy or grey sweater), etc. Have a great work day everyone!! Hope you enjoyed today’s post. "Casual Friday in Camel Culottes"
These are great layering tips! Especially about checking the bulkiness! I love the color of that sweater and that checked blazer is so good! The ultimate fall staple! I love how mustard pairs so well with other colors! I totally agree! It’s so pretty with navy, black, or burnt orange! Such a great combination … Love these colors for fall. Cute outfit, I love the mustard sweater on you! Ok, that color looks divine on you! I can see why you’re so obsessed with that sweater, it’s so rich. 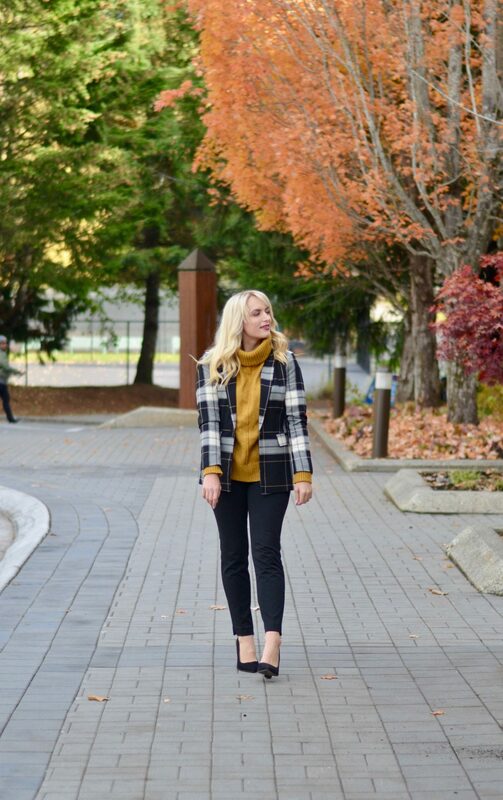 Mustard & plaid were meant for each other – love this combination! Right?! Such a great combo! You layered this look so perfectly. I can’t help but think of Cher from Clueless whenever I see mustard and plaid together hehe. But of course, your look is much more chic – and I love it! The sweater seems super cozy too! Haha oh my gosh, you’re so right – it’s so Cher!!! Mustard is one of my favorite colors during fall/ winter! This blazer really makes it pop though! Okay, LOVE this look! That sweater looks amazing paired with the blazer! Thank yu so much Liz!! Checking the bulkiness is such a huge deal! It makes a big difference! I love how you layered this look! Omg i love this mustard sweater! So so cute and perfect for fall! It’s sort of weird, but I’ve always hated this mustard color. However, seeing how you layered it with a print makes me actually really like it! Plus, this color looks incredible on you! You’ve inspired me to give this color a go, thank you for the inspo! !